If you want to impact on things like local Planning strategies then you need to start a lot earlier than this and you need to be commenting on the underpinnig documents eg Directions 2031. To a large degree the shire is at the mercy of WAPC and DOP who have a polciy to infill in the metro area to fulfill poulation growth needs into the future (2031). By the time it gets to this stage its largely too late. That’s not to say I am not sympathetic to your woes (and mine) but its just the way the planning process works. 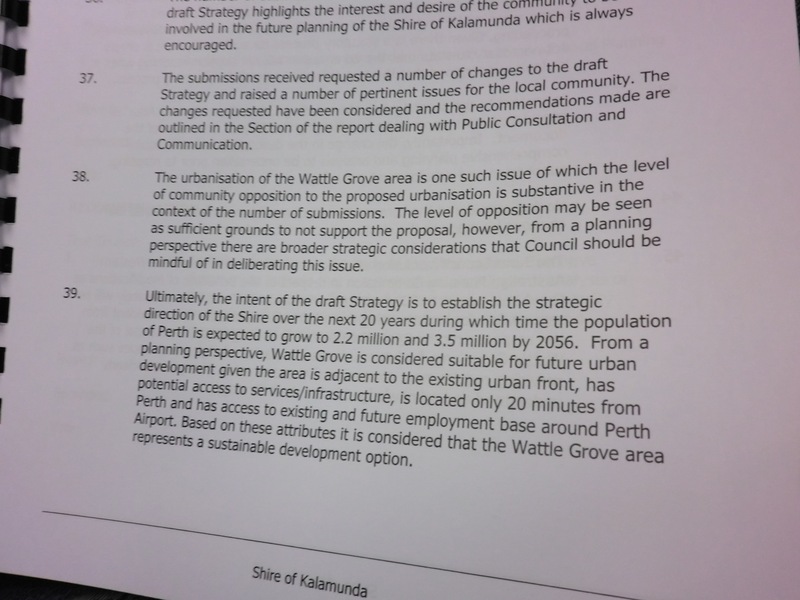 At the same time I am not impressed with the way Kalamunda Shires planning people work and what their sympathies are. If you are going to criticise and be listened to you also need to provide them with alternatives. The planning process is long and complicated and starts back a lot further than this LPS. Subscribing to WAPC planing updates is useful to get a bit of an edge on things. Thanks for your comments. In this case we have done everything you have suggested that we needed to do. We looked at Directions 2031 and commented on it. We hired town planners to find alternative sites for aged care facilities and yet, the Shire did not seem interested. Lawyers have also been involved. It’s not like we’ve sat around doing nothing for the past 7 years. I don’t think it’s too late. We will continue to fight to keep our area rural. I am so incredibly saddened by this. Reading the output by the Shire makes me realise this so called aged care facility is only the first step. If this re-zoning goes ahead, I can foresee Wattle Grove becoming a service centre for companies wishing to use the airport. That will be warehouses, office buildings and other such businesses. To have a view as to what will happen, just look at Horrie Miller Drive and think of other cities and how these areas, close to airports look.